4L of milk today, most ever! Di is back in the UK, so we invited Chris for a couple of beers (three at the most) at bar do clube - we never learn! Seven beers later we stumbled home!!!! So much for me making cheese this evening! 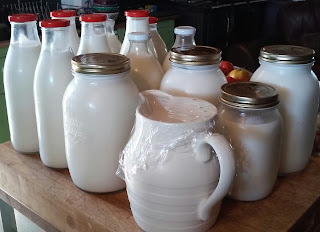 I had no choice but to make cheese today as we had 16L of milk filling the fridge and every available vessel (and that was before I milked this morning! 10L made into Halloumi and 6L trying another recipe for Mozzarella! 12 hours later, I have a big jar of Halloumi (it works nearly everytime now ) and several balls of Mozzarella (still rather rubbery) and only 4L of milk (today milking) in the fridge (tomorrow it'll be 8L). We did have a couple of hours off when we went to visit Sarah & Greg (unfortunately Greg was working, so not at home). We've invited them to dinner Thursday evening. A huge group of us went to the Idanha barragem for a picnic lunch - it was a fabulous afternoon, lots of bobbing around in the water! 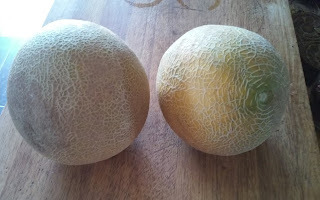 We picked our first two melons today (Gala), slightly under ripe but very sweet and juicy. 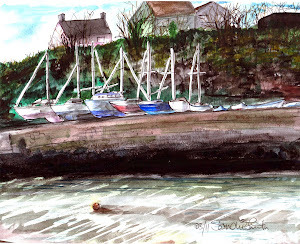 The morning was lost speaking to solicitors and writing letters (boring stuff). While we were on the phone Brett was jiggling around playing with his shorts; after the call he dropped his shorts and a centipede dropped out (I didn't see it). We have these big centipedes here (Scolopendra cingulata, also known as Megarian banded centipede, or the Mediterranean banded centipede), it has a rather nasty bite (and can cause anaphylactic shock)- fortunately Brett didn't react. 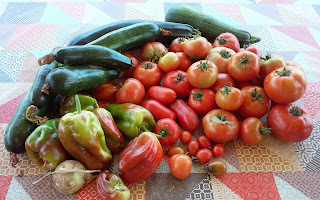 It's the time of year when harvesting produce gets boring! There's just so much to pick; then we have to eat or process it. Apart from basics like salt, pepper, sugar/honey, flour, rice, pasta etc every meal is prepare from ingredients we've grown/raised. We are eating pretty much a vegan/vegetarian diet atm (very occasionally we eat meat to make room in the freezer!). But I shouldn't moan, we came here to be self sufficient and we're more or less achieving it (it's just bloody hard, continuous, work!). Anyway just finished dinner and we're off to the pool with a couple of beers!!!! We are no longer using any shop bought milk but we still had 11L of goat's milk in the fridge. So today I made (a very long winded) cheddar, took me all day. Brett harvested carrots and beetroot. 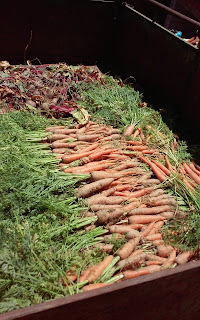 The carrots went into a tub of damp sand and the beetroot cooked for pickling. A bit cooler today, only 31C - I can cope with this. Goat's milk yoghurt sieved to thicken. More melons picked (and tomatoes, peppers, courgettes and cabbage). Greg & Sarah are coming to dinner tonight, so I spent all day cooking and cleaning. Everything for dinner is from the quinta. Starter; A meze of Presunto ham, mozzarella, melon (watermelon and Gala) and cherry tomatoes. Main: Roast chicken, smashed potatoes, ratatouille, lemon glazed carrots. Puddin': Creme caramel (made with goat's milk). Brett harvested the potatoes, not a particularly good yield - as he said if we needed to grow potatoes to survive we'd be dead! We get blight, always have, it was here when we came - we thought we'd avoid it in a hot, dry climate. We had a good evening, sitting out on the decking; eating, drinking and talking. We didn't get to bed until gone 1.00. Today's cheese is Creamy Feta (slow ferment method), it has to ferment at room temperature for 24 hours - I've put it in the darkest corner of the kitchen to keep it as cool as possible. Brett is really into vegetable gardening this year and it shows, far less weeds than in past years. Claire brought us an amazing book on fermentation (The Art of Fermentation, Sander Ellix Katz); today I prepared a bucketful of tomatoes to make Conserva Cruda Di Pomodoro (Fermented Tomato Conserve). Every other day we thoroughly water our vegetables (the day in between we water our field of maize) and harvest all our ripe produce - today's offering: a big bucket of courgettes, tomatoes and peppers (more work for me processing this lot). 1.5L milk out in the heat, making yoghurt; it's not as creamy as Greek yoghurt, but I can make it thick by straining out some of the whey AND it's free! 24 hours later and the Feta looks as if it's going to work! Last time I used this method (slow ferment) I used a buttermilk culture (mesophilic) as my starter and it didn't work; instead of the whey fermenting and the curds sinking, the curds fermented and floated (it wasn't wasted, the pigs liked it!). 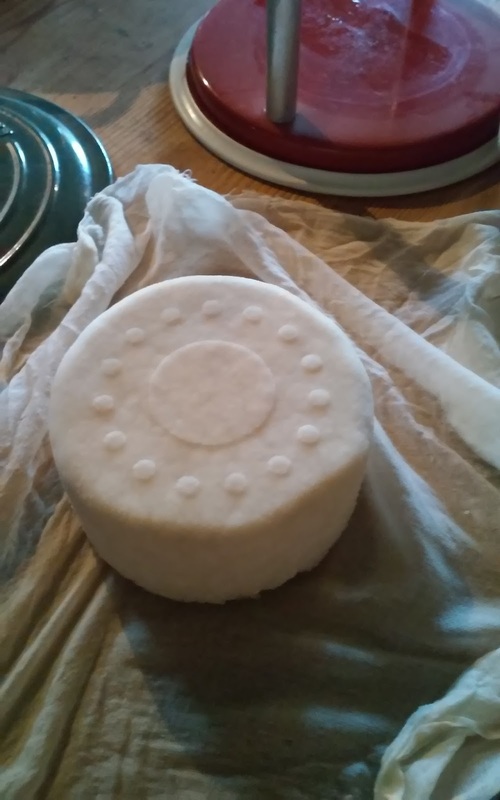 This time I used active whey as my starter, saved from making the cheddar, and I have lovely soft sunken curds (which now have to drain in mould for 24 hours). This means I can now experiment with making aged Chevre. The cheddar has had two days air drying next stage was cloth wrapping it with butter muslin (coconut oil was used to hold it together - traditionally this would have been lard). Now it'll mature for a few weeks (unfortunately in the fridge as we have no cellar or cool areas). More tomatoes sundrying; we've nearly finished the seven big bags I made last year. Mainly blitzed up with olive oil to make a fabulous paste; great as the sauce for pizza,on toasted bread as part of a meze or simply used as flavouring in sauces/soups). This evening we are going to the local produce festa in Penamacor, it was brilliant last year. However as the time to go out gets nearer we're becoming less and less enthusiastic. We went to the festa last night and it was disappointing. Nowhere near as much going on as last year, not that many people, the stalls were 'same old, same old'. We ate from a food stall (Brett had Leito cooked in bread, I had pizza), it was ok, but Brett still felt hungry. So we went to JCJ's (Brett had a burger and we shared some chips). Then we went home. Jelisa is not up to par; she stood on the milking table not eating and spitting out her cud! She could be on heat (it doesn't feel like heat) or she could have eaten something that disagrees with her. My Conserva Cruda Di Pomodoro has a white mould on it (it's supposed too!) I'm so excited. Today I made a fermented salsa (tomatoes, onion, garlic, pepper, active whey and salt). It'll be ready in a few days. The feta cheese is out of the mould and air drying for 24 hours. And I'm trying to make the slow Mozzarella again (using whey as my starter). These slow ferment recipes take days to process (but I'm not using any chemicals just natural organisms), fortunately at lot of the time is just hanging around. Jelisa is back to normal, apart from a litre less milk (she obviously didn't eat much yesterday). Mark is over for a flying visit, so he came to dinner and stayed overnight. 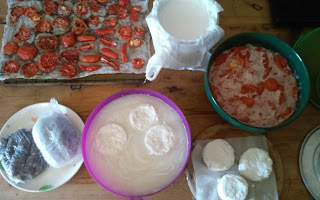 The Conserva Cruda Di Pomodoro was ready for the next step; removing the skins and seeds, then straining through cheese cloth - well my mouli sieve didn't work, a metal sieve was not much better, I ended up using the juicer (which is crap) and the amount left is pitiful! Back to cheese making experiments; today I started an aged Chevre, Crottin (translation from French apparently is little turd!). It has to ferment for a couple of days, until a white mould grows on it (unfortunately room temperature here is rather hot). no way around it (thank goodness we weren't fleeing from a fire!). We had to back up, go back to the house for crow bar, shovel and rope. Whilst we were moving it Joao & Hilda turned up - they thought we'd crashed the car. LOST IN TRANSLATION: We told them we were off to Meimao (and Meimoa to eat); he was saying (in Portuguese) the 'soupa de pedra' was good, then he looked at his watch and seemed to be saying come and quickly have some soup with us ...... we said "We don't understand", but he was bring his fingers to his lips (eat food), pointing towards his house, saying "rapido" - so we said "ok" (couldn't think what else to say!). Then, as we drove to their house, we realised/decided he said 'go quickly they start serving at 12.00' (or words to the effect). Oh dear, our Portuguese 'nao es bon!'. This evening we harvested half our black eyed beans.